Fairview House will be under-capacity next school year. Collegian file photo. Editor’s note: A previous version of this article stated that Butler’s Irvington Campus was the university’s original location when it was Butler’s second campus that was located in Irvington. As students walk down Hampton Drive, they are able to witness Butler University’s “2020 Vision” being built from the ground up. In this school year alone, the Irvington House has developed into a 647-room residential facility for next year’s first-year students. This new dorm will create more housing opportunities for next year. The class of 2022 will be able to live in both Irvington House and Residential College, and one unit in Fairview House. In addition to Fairview, Irvington will provide first years with brand new amenities, such as laundry rooms on each floor, entertainment stations and a workout room. 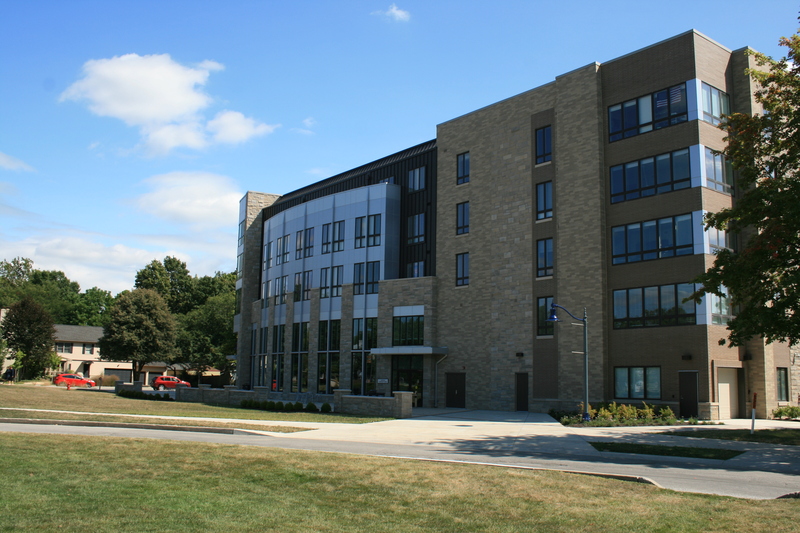 The residence hall was named Irvington House after Butler’s second campus location on the east side of Indianapolis. Abbey Wells, a high school senior from Evansville, Indiana, plans to study biology at Butler next year. Current students have until March 4 to declare their housing intentions. Next year’s sophomores will primarily live in Fairview or Greek houses, while next year’s juniors are allowed to live in Apartment Village, select Greek houses; a small percentage will also be allowed to live in Fairview. Next year’s seniors are still permitted to live in off-campus houses or apartments. University Terrace, Butler Terrace Apartments and CTS Apartments will be available for both juniors and seniors. The plethora of housing options for the next school year Is a stark contrast to this year’s housing shortage. Students had to manage displacement and the trek from Butler’s apartment complexes. Considering the small size of the class of 2021 and the multitude of options for the class of 2020, the question then arises: does Butler have too much housing? Doug Howell, associate director of Residence Life, explained that there are many variables within the housing process. Students who plan to live in Fairview or any apartments will have to have the luck of the draw to choose which room they want. Rooms are decided by a lottery style drawing process, which begins after spring break. Butler also believes in a “progressive housing” system, in which students, as they grow older, are presented with more independent style residences. “We hope that the progressive housing is an outside the classroom learning experience that helps students to obtain the necessary skills to live off campus,” said Howell. These skills include sharing a living room, cooking, and communicating with an off-campus landlord. In addition to conventional skills, Butler also seeks to foster a community within residence halls. Residential assistants are encouraged to promote bonding and interaction within residence halls in order to further this sense of “home away from home”. Ivan Ross, a sophomore political science and history major, found out on Monday that he was accepted to be an RA for next year in Fairview House. “I hope to promote community by encouraging student conversation, disallowing intolerance, and using activities to allow students to to meet one another and develop good relationships,” Ross said. With these residential skills and community bonding, Butler students are presented with a multitude of opportunities for social and personal growth.